Regulus Terentius is the count of Bravil, a rare example of a count that has seemingly let the power go to his head. His son, Gellius Terentius, is known around town as a skooma addict and regularly leaves the Castle for the privacy of the Skooma Den. Both of these facts are items of great gossip among Bravil's townsfolk. The count's day begins at 6am when he wakes. He then spends a leisurely two hours relaxing in his private quarters. At 8am he heads to the Great Hall where he sits on his throne until 6pm. He then returns to his private quarters for two hours to prepare for his formal dinner in the North Wing at 8pm. After four hours of feasting, he wearily makes his way back to his private quarters and retires for the night. He is armed with a silver longsword, and wears a blue velvet outfit with blue suede shoes. He has a sizable amount of gold, a leveled piece of jewelry, the Bravil Castle Key, Castle Bravil Interior Key, and the Bravil Dungeon Key. When you first meet him, he will rudely introduce himself with, "Regulus Terentius, Count Bravil. Good of you to introduce yourself, stranger, but no point, really. I'm the count, and you have no business talking to the count, right? Good. All straightened out. Off with you, then." Asking him about Bravil won't provide you with much information; all you'll get is a cursory, "Yes, yes, Count of Bravil. Are you a foreigner? Do yourself a favor. Learn the basics about the places you visit. There. Problem solved." 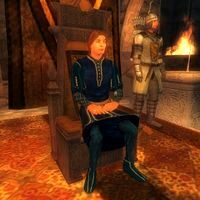 You're not the only person he doesn't enjoy the presence of: he also doesn't have a very high opinion of High Chancellor Ocato, as shown by his dismissive statement, "He thinks to use his position as head of the Elder Council to make himself Emperor. He will not succeed." If you're looking to buy a house in Bravil, the Count will sell you a small shack on the bottom floor of a duplex in the south side of town for 4,000 gold. He'll be surprised at your interest and ask, "Really? It just so happens there is a modest shack overlooking the canal. It's not much to look at, but the smell will soon make you forget how ugly it is." It's quite small but conveniently located below the house of fence Luciana Galena. When you agree, he will give you the key and say, "Very well. I'll have my steward register the deed of ownership. Here is your key. It's squalid little shack, I'm sorry to say. Oh, and the place is fairly bare. If I were you, I'd head on over to Nilawen at The Fair Deal and get some furnishings. Or you could always eat off the floor... doesn't matter to me." Telling him you're not ready to buy doesn't bother him much, as he'll tell you, "It's of no great consequence to me." Tell him the price is too high, however, and he will be irritated at you and snap, "If you didn't have the money, you shouldn't have wasted my time." During the quest Allies for Bruma, the Count will show even less manners upon your greeting him: "Regulus Terentius, Count Bravil. I'm really rather busy, and I doubt that you have anything to say that I need to hear." Ask for help before closing the Oblivion Gate and he'll understand your request, but still refuse. As he puts it, "I wish I could help. I understand the need to help defend the heir to the throne. It is a duty we all share. But with an Oblivion Gate threatening Bravil, I need all my soldiers here." He reasons further with, "I won't risk my Guard attacking that infernal Oblivion Gate. We'll hold the walls and hope for the best." When the gate is closed, he will thank you—in a gracious tone rarely heard from him—with, "Thank you for closing the Oblivion Gate that was threatening Bravil. I will send my guard captain, Viera Lerus, to Bruma's aid." He'll later add, "I've sent Captain Lerus to Bruma. She is one of my best soldiers. I'm glad to be able to help defend the heir to the throne." If Viera died however, he won't provide any additional help and will instead say, "I would like to send help, but unfortunately my guard is short-handed with the death of Captain Lerus. I need all my soldiers at home right now." The upper class may express their less-than-friendly opinions on Regulus and his son. For example, "With Regulus Terentius for a father, what do you expect from Gellius? The acorn never falls too far from the tree," or "It is fashionable to make fun of Bravil and Regulus Terentius. Personally, I think it is poor sport to mock the poor and disadvantaged." He is the only count not marked as essential at any point in the game.